Dr Raed B’kayrat Managing Director of the Clean Energy Business Council discusses the latest developments in renewable energy deployment in the Arab Region and its key role in desalination. Dr Raed B’kayrat: Around the end of June this past summer, the world has reached an important milestone where cumulative capacities of solar and wind installations crossed the 1000 GW mark, with the next 1000 GW of solar and wind installations expected to be achieved in the next 5 years or so. The Arab region, especially in Gulf countries, has been seeing wider adoption of renewable energy which is starting to impact the electrical power sector across the board. Also, the water – energy nexus in the Arab region has been strongly influenced by the integration of renewable energy, which are inherently variable generation sources, as renewables drive forward the energy transition across the middle east region. 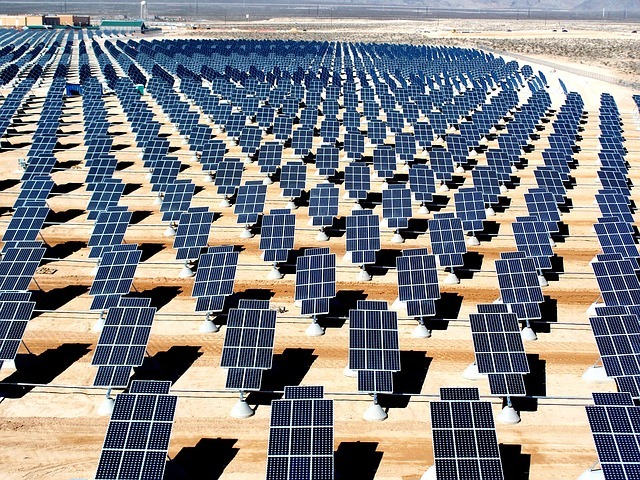 The shift from centralized power plants to distributed generation, mainly driven by onsite, rooftop solar PV and the commercial / industrial acceptance of solar PV by the private sector investing in business to business power purchase agreements, where it is allowed by the regulatory frame work in that country. 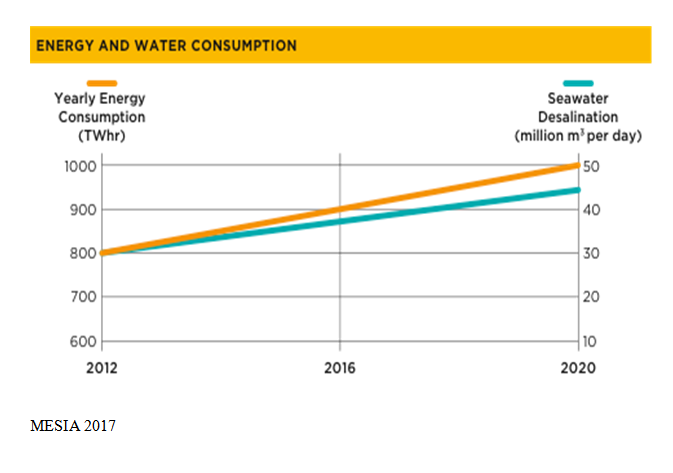 The ingress of renewables along with developments in Reverse Osmosis technologies have allowed for decoupling between power generation and seawater desalination. Where coupled generation of power and water has been, for decades, a trade mark of large-scale power and water plants, especially in the GCC. Water desalination is typically an energy intensive process and largely powered by fossil fuel sources. As a result, the CO2 emissions associated with water desalination are considerable: It is estimated that the currently installed and operational desalination plants worldwide emit around 76 million tonnes of CO2 per year (Masdar, 2015). As desalination is increasingly considered by governments and consumers around the world to address hydric stress and climate change resilience, public and private sector actors felt the urgency to bring together key stakeholders from the energy and desalination industries, water utilities, governments, financing institutions, academia and research & development (R&D) with the mission to reduce CO2 emissions from existing and planned water desalination plants in all world regions. As a result, the Global Clean Water Desalination Alliance (GCWDA) was launched at COP21 in 2015. The GCWDA has become a dynamic platform and saw a steady increase in the number of its members which has reached in 2018, 163 organizations from 40 countries and 6 continents representing leading public, private, research and civil society organizations. 3. after 2035: Ensure that 80% of newly built desalination plants are run on clean energy supply and energy efficient desalination processes. Aside from adding renewables to the energy mix and considering decarbonzation of water treatment and desalination operations, it’s important to consider the mostly untapped area of energy decarbonization, which is energy efficiency. There, the Clean Energy Business Council or CEBC is a not-for-profit organization looking after bridging the gap between the private sector and public sector in the clean tech space. Communications; looking at promoting best practice and spreading the knowledge about the ESCO business model. Industrial Energy Efficiency; Develop the market around industrial, manufacturing and processing operations. Finance Group; working to support creating a market environment that is able to attract needed finance and liquidity to support project execution. As we globally strive to reduce the massive burn rate or our allowance in climate warming emissions, which is expected to run out by around 2041 if we use the 2C rise as the threshold which we do not want to exceed for our planet earth, it is fair to say that the Arab region is making strong strides towards its role in decarbonizing its footprint in energy and water across the board with the GCC leading the pack in terms of project size and execution speed. It should be noted that the path for decarbonization is still long and wide for the Arab region, with more work to be done on the regulatory, policy and business attraction side but concrete steps are being taken by governments which provides hope of success in the short and long term. 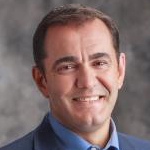 Dr. Raed B‘kayrat Managing Director of the Clean Energy Business Council, is a speaker at the upcoming Dubai Solar Show 2018 which takes place in Dubai 23rd-25th October alongside WETEX 2018. Based in Masdar City in Abu Dhabi, the Clean Energy Business Council is the pre-eminent organisation representing the private sector involved in the clean energy sector across the MENA region.